A research firm Strategy Analytics in its recent report revealed that Finnish mobile maker Nokia has become the world’s largest Windows Phone vendor in the fourth quarter, as global shipments up 36% to reach 2.7 million units. 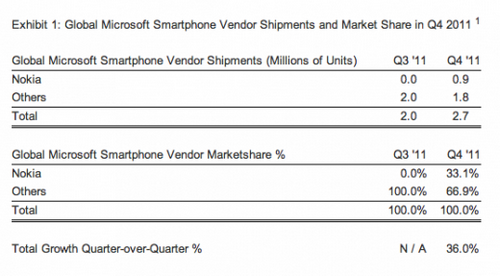 With 33.1%, Nokia accounts for about third of all Windows Phone shipments. It is the first time in company’s history that it has raised to top spot, beating Taiwanese vendor HTC. It is through the sales of Nokia Lumia 800 and Lumia 710 smartphones, launched back in November last year, that Nokia could be able to capture the top rank. According to research firm, Nokia’s global Windows Phone shipments remains at 0.9 million units, while company itself announced in its Q4 financial report that it had sold more than 1 million units of Windows Phone handsets. Certainly, Nokia overtaking HTC is not a big surprise, as the Taiwanese company has been forced to go back to basics over the recent two quarters after its sales dropped following the increased competition from its major rivals, including Apple and Samsung. In one of its statement, HTC said that all its focus is on ‘hero’ smartphones, with a view to consider different aspect thoroughly instead of releasing a large number of handsets with slightest of improvement in specifications. This is why company has to back off on its Windows Phone plans in 2012. In addition to all this, the Finnish mobile manufacturer has an exclusive agreement with software giant Microsoft to license the Windows Phone platform. Nokia seems to be a potential Windows Phone vendor for Microsoft as it continues to show growth in sales of Windows Phone. Now the question is whether it is capable of facing a tough competition in the global smartphone market.